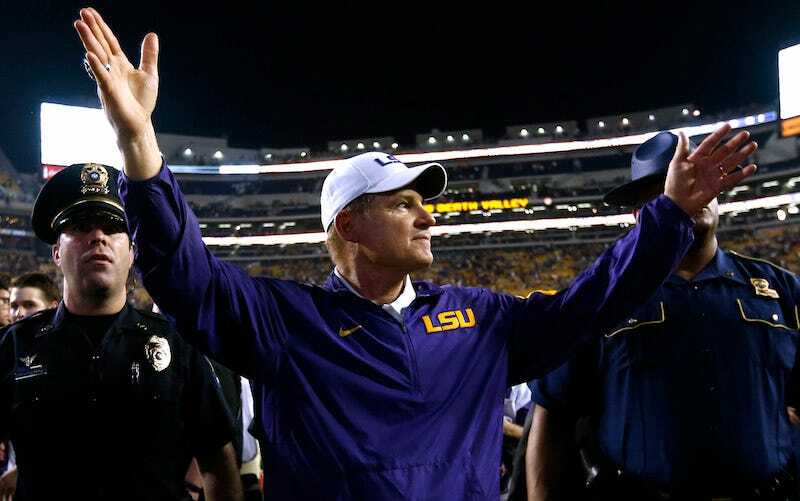 LSU and football coach Les Miles seemed destined for a split at the end of the season, thanks to some profuse and premature leaks, but after Saturday’s win over Texas A&M, athletic director Joe Alleva announced Miles will return. According to four sources in Thursday’s report from The Advocate, the school was in active negotiations with FSU head coach Jimbo Fisher days before LSU’s win. The university began leaning toward keeping Miles as early as the Wednesday before LSU’s win over Texas A&M last Saturday, and a final decision was announced to some LSU Board of Supervisors members during a meeting at halftime of the game. Intermediaries from LSU and intermediaries for Fisher were in discussions as late as last week about the former Tigers assistant coach replacing Miles, but those talks curtailed late in the week. [Jindal], a friend to Miles, made calls to high-ranking officials before Saturday’s game. He expressed his concern at how the situation had been handled and encouraged officials not to part ways with the coach, a source said. The cost was a major factor. It would have taken approximately $17 million to buy out Miles and his coaching staff. Combining that with the hiring of Fisher, the exchange would have been around $30 million. Though the Advocate says private donations would have covered the amount, school president F. King Alexander knew it would have been a bad look from the outside, since LSU dealt with a budget crisis earlier this year. For now, Fisher stays where he is, and Miles gets to keep eating grass.